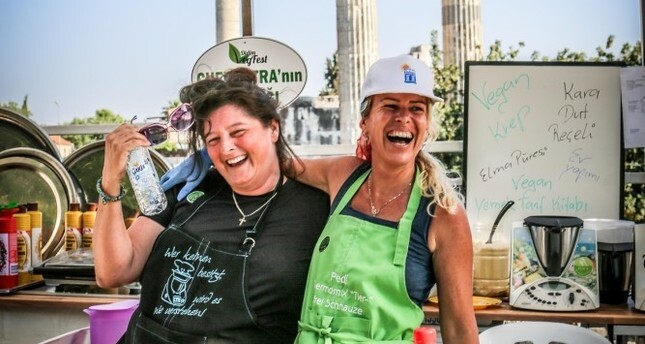 Didim Vegfest promotes veganism and green living. As Turkey's first vegan festival, Didim Vegfest is set to start on April 19 right next to the remains of the Temple of Apollo. Throughout the four-day event, Didim Vegfest will hold more panel sessions than last year on animal exploitation and veganism, enabling people who are considering becoming vegan to ask questions about the concepts and eating habits. The festival committee also announced that dietitians would work in the field during the festival to inform participants on vegan lifestyle choices. Commenting on the festival, Didim Mayor Ahmet Deniz Atabay said that Didim and the entire Aegean region is famous for its green cuisine and that this will manifest itself at the festival as well. "With this festival, we are promoting and keeping this cuisine tradition alive. We want to show people that animals can also feel what we feel. The festival is attracting enormous attention, which you can see on social media as well as the reactions of the locals. I believe that the festival will continue to grow," Atabay said. The festival welcomed about 200,000 people last year, and this year the organizer has projected even more visitors.